Hi everybody and happy Friday! If you're new to Friday Firsts click the link above or in my sidebar for more information. I have been occupied the past few days by Project Food Blog! It has been a whirlwind so far. We had a 5 course dinner with 7 guests for Challenge 3 so I really hope I make it! I'm excited and hopeful. Thank you if you took the time to vote for me, it really means a lot. As if you couldn't see it coming a mile away - my first for this week is Tamales!! For my Challenge #2 entry I tackled authentic Mexican cuisine. I made the masa, the pork filling, and the chili sauce all from scratch. Then Johnny and I hand rolled 71 tamales and steamed them. They turned out terrific and I'm so glad we have some in the freezer to enjoy later from all our hard work! I can't WAIT to read all about your dinner!! I read your Twitter...I'm so glad it went well! Hope you rested! p.s. I'm jealous. Mine isn't until Sat, and I'm freaking out a bit. BTW, have I ever told you how much I love your Friday Firsts? So fun! I was impressed with the 71 tamales! I voted and I so hope you make it through! We find out today right? Sorry you didn't make it to the next round Christina - but at least Kath didn't make it so that's making me happy. 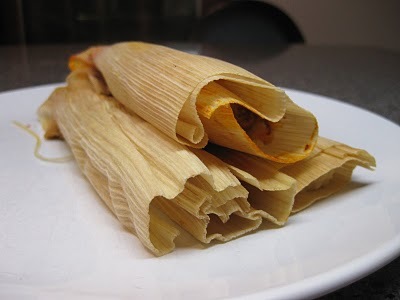 I thought of your Tamales post last night during out dinner as we discussed a bizarre Midwestern dish that Michael grew up with called "Hot Tamales" that in no way resembles actual tamales!